I thought it was about time to remedy my son's lack of hand print memories and figured a layout was the perfect way to do so. Lucky for me, I had the perfect story to tell about a book called The Kissing Hand that his teacher read to him on the first day of school. I painted his hand with non toxic washable paint and gently pressed it onto white cardstock. I made about four impressions on a 12x12 piece of white cardstock so I could choose the best one! 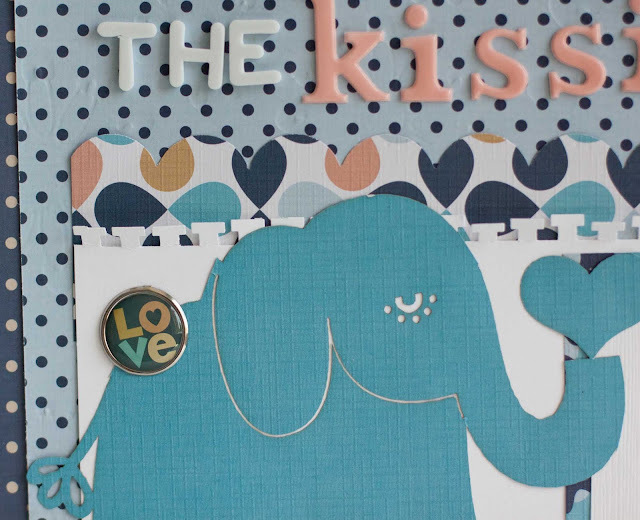 The story is actually about raccoons, but I thought the elephant with heart and little turtle (from the die cut sheet from the Animal Crackers for Boys collection) were too cute not to include. 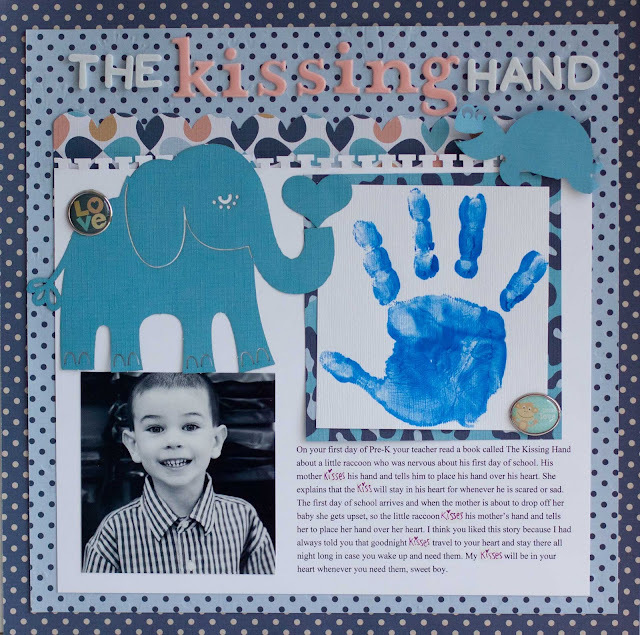 I hope this gives you some ideas of how to include those little hand prints on your next project so we can always remember how small they were! umm, that sounds like me! I don't know that I ever did any hand prints with my kids I have some but I didn't do them! :) I really like how you remedied the problem, such a great layout! AND that font is SO cute! oh my goodness! 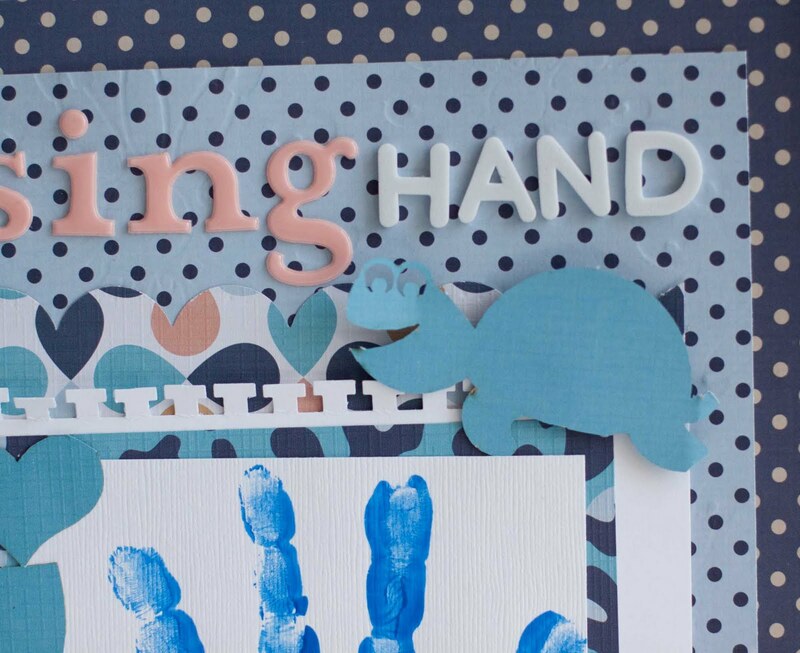 I so love your inspiration handprint finds... and your layout is just so perfect!!! GUILTY as charged!!!!!!!!!!!!!!!!!!! 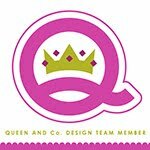 !1 fab idea I may just have to borrow it for my poor ly done by second! 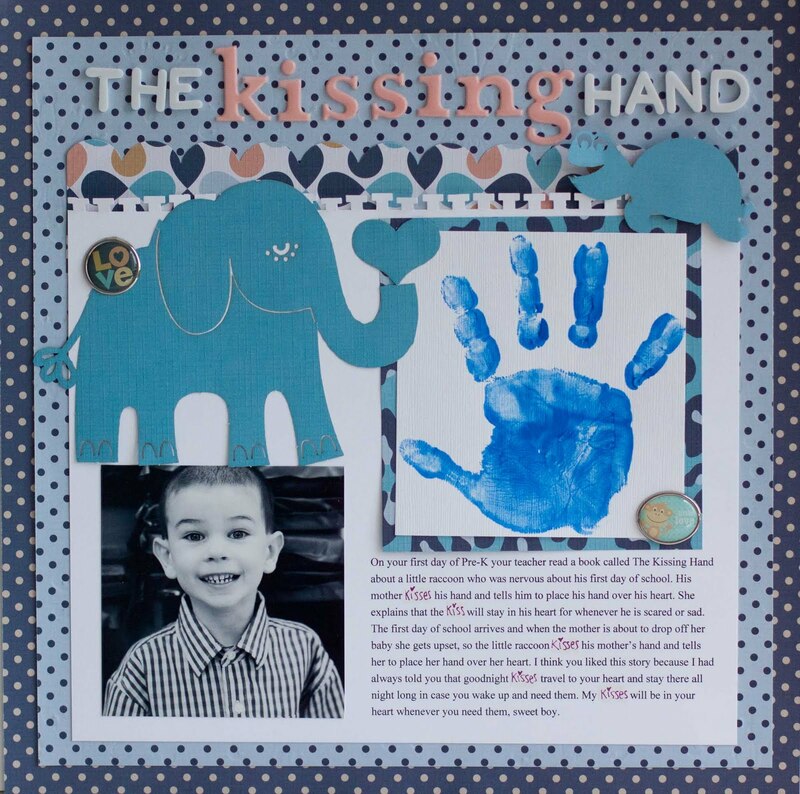 I LOVE this layout and how you used the hand print. Great job girlie! Love the use of hand prints in our art. it is such a wonderful and personal touch and great way to measure growth. Those canvas hand prints are a great idea. Nice find. It would be cool to do a collage of canvases with hand prints from everyone is the family. Such a sweet layout and a great story! Such a great layout Rebecca! I love the handprints! Love how you put the hand print on a layout.